(Nanowerk News) A multidisciplinary team at the Centre d'Elaboration de Matériaux et d'Etudes Structurales (CEMES, CNRS), working in collaboration with physicists in Singapore and chemists in Bristol (UK), have shown that crystalline gold nanoparticles aligned and then fused into long chains can be used to confine light energy down to the nanometer scale while allowing its long-range propagation. Their work was published online on the website of Nature Materials on 26 October ("Multimodal plasmonics in fused colloidal networks"). Light can be used to transmit information. This property is, for instance, used in fiber optics, and provides an interesting alternative to microelectronics1. Using light increases transmission rates and reduces the energy loss caused by heating when an electrical signal is used. However, several obstacles remain to be overcome, in particular that of miniaturization: optical fiber makes it difficult to confine light within volumes of less than a micrometer (10-6 meters). Electrons move freely through metals and sometimes begin to oscillate collectively on their surface under the effect of light, as in noble metals such as gold and silver. The properties of such collective oscillations, known as plasmons, have in the past twenty years paved the way for subwavelength (i.e. less than one micrometer) confinement of light energy. By transmitting the energy carried by photons to moving electrons it is possible to transport information in structures narrower than optical fibers. To reach even greater confinement, plasmonics2 is now focusing on the optical properties of crystalline nanoparticles. The smooth crystalline surface prevents disturbing the electron oscillations and reduces energy losses. Exploiting the properties of such nanoparticles should therefore make it possible to simultaneously achieve confinements in the nanometer region and the long-range transport of information. In this study, the researchers showed that when gold nanoparticles with a ten-nanometer diameter are lined up in a chain, the plasmons they carry generate specific oscillations that are conducive to highly confined propagation. However, energy is lost with each passage between two nanoparticles. Although this characteristic can be exploited for certain applications that require highly localized heat sources, especially in medicine, it is not conducive to long-range propagation. The researchers therefore carefully fused the nano-beads by focusing a high-energy electron beam on them, thus forming a continuous crystalline network. They observed that energy loss was reduced and that the plasmons were free to oscillate over very long distances, while remaining confined within the diameter of the nanoparticles. Within this bead string, which is a mere ten nanometers wide, information can travel as far as 4000 nanometers. 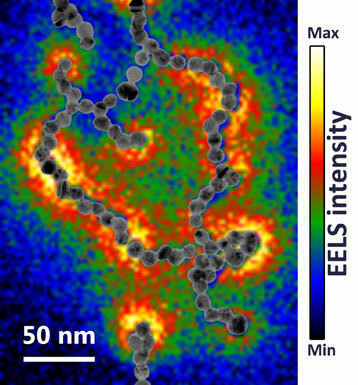 Another challenge successfully met in this study was to map, with exceptional precision, the electron oscillations observed at the surface of the nanoparticle chain. The different types of motion of the plasmons were characterized using a microscopy technique called electron energy-loss spectroscopy (EELS), whose very fine spatial and spectral resolution enabled the researchers to propose a new theoretical model of plasmon behavior. Simulations based on this model reproduce the experiments with unprecedented accuracy. This work, which was the result of a long-term collaboration with teams in Bristol and Singapore, could lead to extreme miniaturization of light guidance and open the way to applications for sensors, for instance in photovoltaics, and in telecommunications. (1) In microelectronics information is transmitted via an electrical signal. (2) The science that studies the collective properties of electrons at the surface of a metal.